The problem nowadays isn’t getting information - it’s getting the right information, at the right time, to make informed decisions. The way that markets are reported affects the way they are perceived, and consequently the way investors behave. John Authers wrote a number of articles exploring the extent to which journalism can have a measurable impact on global markets. We saw a recent example as Elon Musk turned to Twitter after the Financial Times revealed that Saudi Arabia’s sovereign wealth fund had taken a $2bn stake in the electric carmaker. This is a perfect visual example of exactly how direct an impact FT journalism can have on moving markets. Customers from large corporations to governments and financial institutions, are using the Financial Times as a source of global market news - ultimately to make more informed decisions. Outputs vary extensively based on our customer needs: from risk or reputation management to time-series analysis and predictive modeling. Our customers value the FT for its unbiased, accurate coverage, its ability to highlight emerging risks and opportunities from around the world, and as an original source of market-moving content. We have good access to the world’s leaders and business, so every report is directly sourced. We double-source stories to verify the facts so FT readers can trust our information. As well as delivering news around the clock, the FT is also able to provide the authoritative analysis and actionable insights that are vital to decision-makers. This expert analysis sets the FT apart, creating rich data points that help customers manage and mitigate risks and make better decisions. We have recently increased our investment in the generation and digital tagging of scoops, but specifically in those around corporate actions, which are likely to directly affect equities and bond prices. The value of these FT scoops can now be fully leveraged in close to real time thanks to our Content API, which is made accessible via a datamining licence from FT Integrated Solutions. 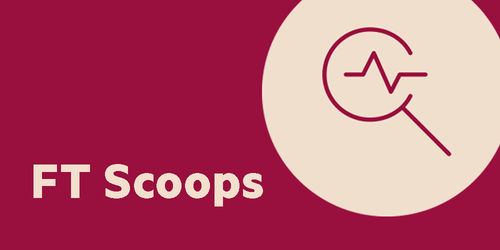 What is an FT scoop? Stories the FT breaks before anyone else are tagged with a metadata tag identifying them as a scoop. These articles have a high propensity to trigger movement in financial markets. Articles with this tag can be discovered in real time with FT Integrated Solutions. They can be useful for improving algorithmic trading models and optimising trading strategies during periods of market volatility. In addition, thanks to the inclusion of unique financial instrument identifiers (FIGI codes) and LEI codes in our metadata, it has never been easier to connect FT exclusives to increased profits in your portfolio. Some examples of recent FT scoops are available here. FT metadata contains, but is not limited to, the names of 4.2 million organisations and 2.6 million people, helping you identify the connections between the stories, organisations, people and events we write about. By highlighting the important topics and entities mentioned in the article, we create structured data-points that can be easily queried by computers to mine valuable insights. Whether you're looking to find new opportunities, mitigate risk or optimise processes, real-time FT articles and metadata can now be analysed at scale or be seamlessly integrated into your internal systems. Once in your database, you can co-mingle or mashup FT metadata with your proprietary data and business logic to produce your desired output. FT Integrated Solutions allow you to better exploit and monetise the value of FT intelligence, by ensuring the right information gets to those who need it, in the right place and at the right time.. We do this by feeding full-text FT articles directly into your databases via API. From CRM and risk managements systems, to intranets and trading platforms, build custom solutions to power your business. How do I find out more about FT Integrated Solutions? The FT is a trusted business tool used by more than 4,000 organisations worldwide. Please click here to find out more or contact us directly if you have any further questions or would like to learn more about our service.